An idea popped up to get a better, more objective comparison of different build plate adhesion solutions for ABS. The idea is simple: divide the build plate into four equal segments, and apply build plate adhesion solutions (glue, hairspray, juice and the like), and print four 3D objects on these segments. It's probably important to have the four segments on equal distance from the centre of the build plate, to rule out any non-uniform temperature. The results of the four prints can be quantitatively compared by measuring warping, but also qualitatively by visual comparison. So here's an opportunity for input for all, because I've a free slot available on the fourth segment. 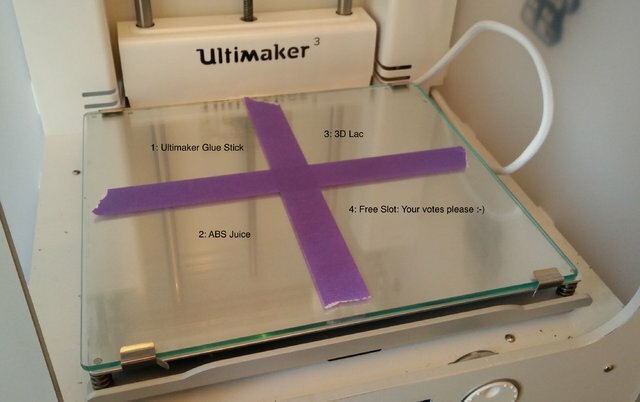 - Which build plate adhesion solution would you vote for to test? - Which one do you bet on will be the best one? - Or, feel free to copy this test and share your results (for instance comparison between Kapton, PEI, blue painters tape, etc). User neotko has good results with hairspray (spray it on a tissue and wipe the plate). And user gr5 has good results with dilluted wood glue (1 part Elmer's glue in 10 parts water, if I remember well). Still other people use dissolved old PVA-support material from the UM3, thus recycling what would otherwise be waste. I printed up some small ABS hockey pucks, one for each color/type of ABS I have. I will squeeze a few drops of acetone from a small syringe onto the glass and slide the puck around. This liquifies the bottom of the puck and mixes with the acetone to smear around onto the glass. I slide it around until the acetone is evaporated and I have a very thin, almost imperceivable layer of ABS dried onto the glass. I find doing it this way is a much cleaner/faster approach than to actually dissolve and mix up a slurry. Other than that, I typically set my build plate temperature to 115 degrees for the first 1 or 2 layers, then switch it to maybe 110 degrees for the rest of the print. I also have a plexiglass cover/enclosure on top of my U2 and a plexiglass door on the front to keep the heat in and the warpage low. All of this has worked very well for my ABS prints. FWIW, I only use AquaNet super hold hair spray (spray onto a paper towel and wipe onto glass to avoid spraying directly into your printer) or blue painter's tape for PLA, never for ABS. Used to use the Elmer's glue, but now only use the acetone/puck method. Ok, thanks, so this looks like 2 votes at least for wood glue. I see a Elmer's being mentioned quite a lot indeed, though Bison is the glue Brand here in NL, so have to go for that brand I think. First result of only using 3D Lac were impressive by the way (with PLA filament). I even had difficulty releasing the print from the bed after cooling down. Not sure yet if this is the same as the suggestion given to use hairspray for the test. Maybe too cautiously applied by myself, or the wrong brand (Andrelon Ultra Hold Fantastic Hairspray), I did not fare well yet trying that. Any other suggestions still welcome until I've found time to do the test. Otherwise it will be wood glue - let me know! What about regular tape on top of your heated bed or adhesive sheets. A (maybe small) factor to take into account, that on the back it may be a little bit warmer than in the front if you don't close off your Ultimaker? If you want to rule out any inconsistencies, you could do a second test and use the adhesives on the back that before were on the front. My site does not handle comments, please post here on Ultimaker Forum. Hope this sheds some lights on how well these methods compare (at least based on this single data point, and do note that these results might be different when printing for instance with PLA instead of ABS). So it could be beneficial if similar tests are shared as well! Thank you for sharing the documentation, interesting read! Do you use any covers with ABS? And ventilation? (altho the latter has nothing to do with warping, but your own health ) Hopefully your 'real' prints will stick equally well when using 3D Lac or the ABS Slurry. Do you always use ABS? It sounded like the ABS slurry lost some points when it got loose from the bed when cooling down, but you could also see this as an added point right? So you would not have to use any spatula to pry it loose. That's sharp! I've measured temperatures along the test (see my site here as well: http://catch22.eu/3dprinting/adhesion/), and what a coincidence, 66 temperature peaks coinciding with 66 layers and the top and bottom walls being 4 layers. The 4 blocks were printed clockwise in my case. The sensor on the print head is placed about 10mm height from the build plate. And I do use a door, but apparently, this still causes a temperature gradient. So you know what causes this? My door has slight draft (not sealing 100%), and the backside holes are sealed with ducktape (as can be seen on the picture). Is there still some draft I wonder (slightly off-topic though). Could it be that a fan is causing the difference in temperature, if the sensor is on the printhead? There are 3 fans in the printhead. You could consider adding a hood to close the top, although I don't think that would case a draft. That would be very interesting, a contest between adhesive sheets, kapton, and ABS juice or 3d Lac. I have been using my UM2 on a near-daily basis since it was first released, and the machine tells me that I have clocked up over 1500 hours of printing time. I started with PLA, but soon migrated to ABS when the mechanical devices that I was building regularly failed under stress using PLA. Don't use cheap ABS - Get Premium grade, which has much lower warp, and better layer adhesion. This need not be expensive - I use 'FilaPrint Premium ABS' from 3DFilaprint.com - about £20/1kg (+free postage). Use a decent build-plate glue. After much experimentation, I have found two products that have served me extremely well over the last couple of years. They are both water-soluble (so the base of the models, and the build-plate are easy to wash), they release the models easily after the glass is cool, they scrape off the glass easily with a razor-blade scraper, and they are not expensive. The first is Bostik's Big Blue Stick, which goes on blue (you can see where it is), and dries clear. I use this for everything except the most demanding (large, flat) print. The second is a bottle of liquid glue made by Pritt. It is just called 'General Purpose Glue', and I buy it in Lidl stores when they have it. However, it is available from places on-line too if you search for it. This is the best adhesive of all, and I have successfully used it on models with a base area over 400sqCm. I just put several drops on the glass and rub it around in a circular motion with a 4cm dia 'rubber' that I printed some time ago. I hope this is of interest to someone struggling with ABS. Sorry the images are not showing, but this forum is driving me nuts. It has taken me hours to make this post, with several attempts failing to appear when I post them. Now, the images are not visible... agrrrrrrr! I was about to make significant post about how I have tamed my ultimaker into handling ABS perfectly, and eliminated nozzle clogging, filament grinding with repeated retractions, and various other tips including how to calibrate hot-end temperatures. But I don't think I will bother on this forum because even if I got the (essential) images to show up, I expect the post would soon become buried and lost as many other interesting ones that I have read here have. 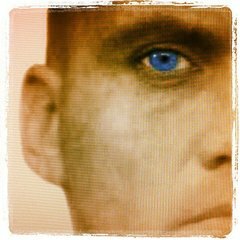 Basically, this forum engine is a disaster! P.S. Problem solved - I've migrated to http://www.3dprintingforum.us which is where a lot of original Ulti-experts now seem to hang out too - including Anders Olsson. 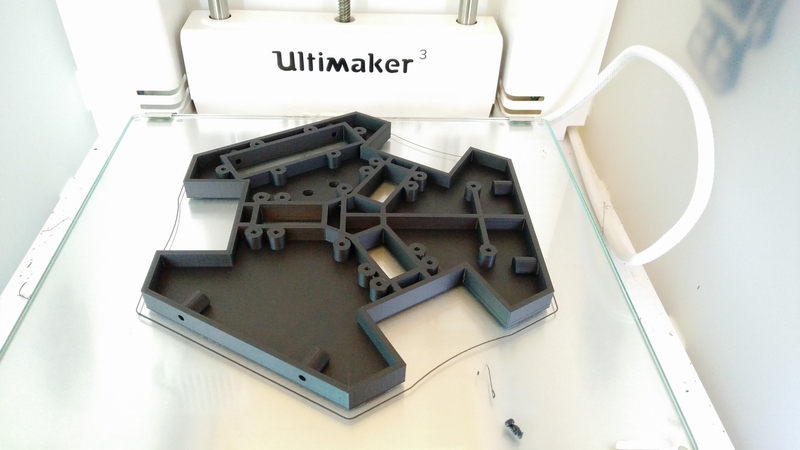 So, if anyone wants to follow my journey through the improvements I have made to my Ultimaker machines and their workflow, then take a look there because, regretfully, I shall not be posting here again. I was actually surprised to see there was no warping at all, the model stuck very well to the heat bed. After it popped off when the build plate cooled down, the model was even bending upward in the center a millimetre or so, so weirdly enough, it had some kind of inverse warping. No clue as to why this happened. The center of your model has a denser proportion of longer/deeper parts that could lead to different cooling times in those areas and thusly push/pull as it continues to cool. Also, I predict he reason is because it does not have a uniform, or balance density in the Z axis. I have come across similar effects on 'tray' type models myself. If you had used a low-warp ABS like Filaprint Premium, then this would barely be noticeable.